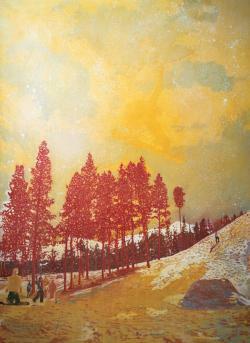 Themes of magical realism stream through Peter Doig’s work, capturing timeless moments of perfect tranquillity, where photo-album memory flits in and out of waking dream. 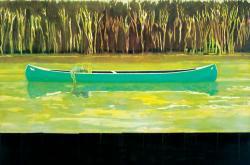 Drawing from his Canadian childhood, and one of the spookier scenes from Friday the 13th, Peter Doig’s canoes have become a seminal image in his work; their reflection in the water, like a double life, is a fantasy mirror to the unknown. Canoe-Lake is rendered with unsettling perfection: capturing not just a spying view over a fence, but the strange echoing silence of drifting on a lake, the impossible stillness of the current, and the cloying warmth of late-summer air. 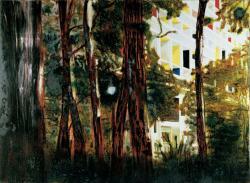 Plainly in view but physically inaccessible, Peter Doig half obliterates The Architect’s Home in the Ravine with an underbrush as dense as a half-finished Pollock and the scene becomes foreboding: something out of an Edward Hopper or an Andrew Wyeth painting. With all the richness of the distant woods and the stunning architecture to look at, it’s the twigs which steal the show. 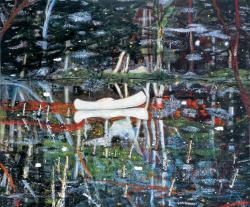 Peter Doig’s painting reinvents the way a picture is meant to be looked at. 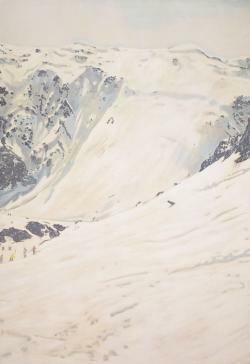 In White Creep, a vast snow-capped mountain juts upward in a way that dwarfs the sky. The snow is white and fresh, yet there is depth to it, implying that this mountain is permanently covered in snow. The snow is an abstract tapestry of white with craggy black rocks peeking through. It is like a Clyfford Still of whiteness, with a palimpsest of grey and blue evident below the surface. 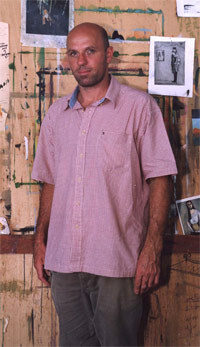 The sources for Doig’s works can come from film, photography, or clips from contemporary visual culture, yet he makes paintings of scenes that could only really be actualised as painting. The contemporary snowboarders seem oddly out of place in the Renoir-dappled sky and Derain-speckled drifts. 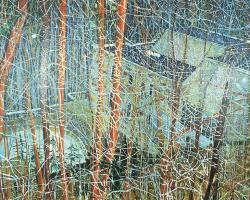 But it’s the way Doig masters this illusionary effect of the paint that creates a convincing, almost tangible fourth dimension - the muffling stillness of the air, the soggy feel of slushing snow, the crisping smell of twilight. Doig plugs into a nostalgia that photography can never capture: the physicality of his paintings makes these generic memories more vivid and desirable than the viewer’s own. Based on the viewpoint of an insect whose perception of the world is found at ground level, Peter Doig created the Grasshopper using three equally spaced bands that command its composition. Broadly coloured yet intricately detailed, this device appears to mimic the geological strata which construct the earth. The top band contains the abstraction of the sky, created from the thin veils of vivid blue masked with successive layers of dragged and dabbed paint. 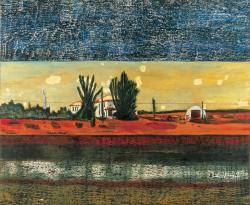 The middle band contains the land, a small settlement isolated in the desert of an arid landscape, the telegraph poles and lines the only clue to the connection with the developed world. Infused with a rich warmth of light, this is a nameless landscape in the middle of a barren land, of no specific time. Reminiscent of the setting for the film Paris, Texas, the only clue to its identity would be the single figure buzzing around a garage. Wing-mirror, Gavin Brown's enterprise, New York, N.Y. Version (drawings), Gavin Brown's enterprise, New York, N.Y.
Fruitmarket Gallery (with Udomsak Krisanamis), Edinburgh, Scotland. Gavin Brown's enterprise, New York, N.Y.